Of course I’m upset. I’m a big believer in protein. But she’s a grown woman and a stubborn one at that. If she were 11, I could try an intervention. I could torture her with spare ribs or a juicy burger and hope for enlightenment. But she’d been a vegetarian before so it wasn’t as if she’d suddenly wandered into an unknown patch of poppies. I guess I already knew Clint and I were not compatible. "I used to not eat anything with legs,” she confides, explaining her conversion to us that first Sunday night at Salumeria Rosi. “That allowed for fish. But now I don’t eat anything with eyes.” It is all because of the neighbor’s cow that ran onto their property to escape the butcher’s truck and fell in their creek. She and Craig ran to pull it out and she saw the terror in its eyes. That was it. No more animals with eyes. I’m wondering if the hostess who greets Steven and me at Candle 79 can tell that we are meat-eating infidels. Not that she isn’t warm and welcoming. I like our “front porch” table but there is no pitch in the angle of the banquette and it’s not very comfortable. The couple at the next table hold hands as they share what looks to me like nachos. Actually, it is nachos. I’m stunned that this temple of veganism can get so down and dirty. And what’s different about vegan nachos? Tofu sour cream and both cheddar and mozzarella made with a tapioca base, not milk, plus corn chips, refried pinto beans, tomatoes, salsa, guacamole, and chili grilled seiten. Ah, there’s the rub. The gluten of wheat. That uncomfortable feeling Dana gets when she imagines the cow’s eyes is what I get when I see seitan. But what the hell. It’s research. It’s one night. It’s love: I adore her. And given the chips and all the usual nachos gunk, these aren’t bad at all. The onion rings taste exactly like onion rings because they’re breaded and fried and they are rings of onion. So far so good. I’m not sure what live avocado is (as opposed to dead avocado) in the “Live Avocado-Jicama Tartare” with trumpet “mushrooms ceviche” and hijiki “caviar” but all of us are spooning it up with quinoa-flax chips. The point here is that everything must be organic (although that’s not always clear cut in these days of little regulation) and I love that much is not what it seems. Horseradish cream is not cream. Cheese is not cheese, but rather macadamia nut paste cheese or spinach cashew ricotta. How much of this stuff do you have to eat before the ravages of age slip into reverse? Alas, one taste of the seitan piccata, a ghastly intervention, is enough for me, and not even sweet potato purée and chocolate mole can save Craig’s citrus herb grilled tempeh. Seitan does best as smoked sausage in the paella – everyone’s favorite. Dana, who actually cooks with seitan and tempeh at home and is fairly bursting with pleasure to see how the pros do it, is clearly disappointed. But I had wanted to check out the latest occupant in the townhouse space on East 58th that was last Nish and March before that, and once the quite thrilling Dodin Bouffant. 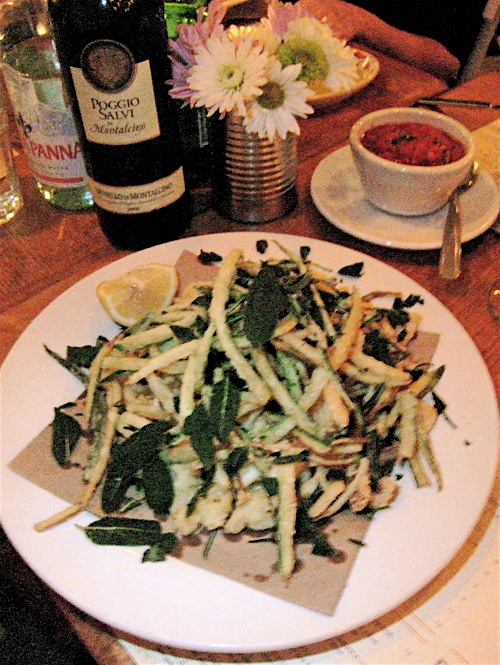 “I guess you could have a plate of vegetables sides – they have spinach, brocoli and eggplant bayaldi,” I suggest. “Oh don’t worry,” says Dana. “I’ll just ask the kitchen what they can do. They always come up with something.” And indeed, I’m srry to report, her vegetable tossed fettuccine is the best dish out of the kitchen that night. 405 East 58th Street between First Avenue and Sutton Place. 212 934 9100. What is it about the French bistro mentality that scorns vegetables, unlike the typical trattoria with its eggplant roulade and fried artichokes, its pizza Margarita and all sorts of soups and pastas? A quick dash with Dana and friends over the Williamsburg Bridge to our Brooklyn haunt Fiore is in order. There are long lines at Curly’s Lunch, she reports, but it’s worth the wait for the Santa Barbarella sandwich on eight grain bread, with pumpkin seed, a pesto schmear, avocado, tofu bacon, jack cheese, cucumber, onion, tomato, lettuce and sprouts, And, she adds: “I love the sweet potato fries. More vegetarian junk food.” 328 East 14th Street 212 598 9998. I decide that dinner at Devi -- one of my dozen favorite New York restaurants --will make up for any slights and omissions of the loving aunt. Indian restaurants expect to feed vegetarians. With its blush silk curtains, carved marble stair, imported carvings and charming colored glass lanterns, the duplex space is always a surprise on a rather dreary stretch of 18thStreet. My friend Suvir Saran is away but as always, his chef-partner Hemant Mathur is in the kitchen. The price of a chef’s tasting here has jumped to $85 since our last visit but it’s Restaurant Week so all of us order the $35 dinner with a side of the spicy okra crisps we can never get enough of and two breads – a garlic naan and spinach-goat cheese paratha. Dana and I share vegetarian options – grilled and marinated mushrooms and the must-have Manchurian cauliflower to start, then stuffed baby eggplant with fresh coconut, spicy chickpeas to pick up with fried bread puffs and a gift from the kitchen, cheese and potato dumpling with lemon rasam soup and sweet and sour butternut squash. I notice Dana is not eating the potatoes. “Is that because they have eyes?” I ask. Now the table is covered with desserts by pastry cook Surbhi Sahni that defy the usual Indian desert clichés, more than we’re entitled to because it’s me – Indian bread pudding with caramelized nuts, mango panna cotta, pistachio kulfi, black forest cake with macerated cherries and my favorite, Devi Bombay Falooda – with honey-soaked basil seeds, falooda noodles, strawberry and mango sorbets, coconut lemongrass milk and a coconut tuile. 8 East 18th Street between Broadway and 5th Avenue. 212 691 1300.